Trying to find a fantastic fitting, well-designed dress shirt can be difficult, especially if you aren't made of money. Usually, to get the perfect fit, you have to order a custom shirt, but who can afford that? Thankfully, there's a new online store that makes it super simple to get your hands on custom dress shirts online without forking over a small fortune. 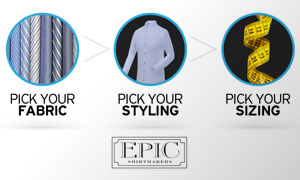 Based out of Florida, Epic Shirtmakers, allows you to build custom dress shirts online using their easy-to-use interface that's packed full of design and style options. The ordering process is super simple. Your first step is to pick one from hundreds of available fabrics in one of hundreds of patterns they have. Want a Swiss cotton shirt with purple stripes? They have it. Need an Egyptian cotton shirt in a solid baby blue shade? They've got that, too. The design interface makes it easy to see just what you're selecting and how the shirt would look on an actual person. The shirt designs are virtually displayed on a mannequin, so you can get the idea of the form and fit. The next step is to pick a collar design. They have 10 available. But the process of ordering custom dress shirts online doesn't stop there. Pick your pocket and cuff styles then enter in your size information. You can go through two routes with this: either enter your usual shirt size, height, and weight, or enter in all of your measurements for a truly custom, form-fit. From there, everything else is left up to the company to complete. Your order will be processed, and the shirt is hand-stitched by a tailor that the company has used for years. The shirt will go through several inspections to make sure it matches your specifications and fulfills your order. Finally, the shirt is sent to you, at which point in time you'll be so thrilled with your new shirt, you won't be able to stop wearing it. Then you'll have to order more shirts. It could become a real problem. Most people can't afford to go to a tailor to have a shirt made from scratch. But this company makes it possible for more people to enjoy the comfort and style of a personally fitted shirt. Just think: you could be ordering custom dress shirts online right now. So, why don't you?